You really can religify everything. 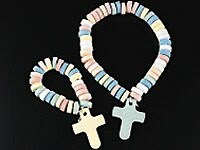 Candy cross necklaces. Mmm, sacrelicious. I'm sure this was from etsy, but I unfortunately can't remember the seller. If not for the weird mouth I'd probably find this kind of cute. Are these mass-produced? They look professionally made, but what store would carry them?! Give me a hand. Or two. ...not quite what I had in mind. Thanks to both of my awesome readers! 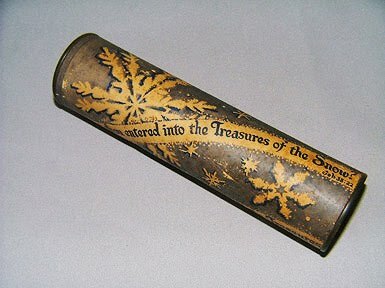 An antique kaleidoscope printed with Bible verses! It's broken - the thing holding the beads in place is smashed up so it doesn't actually work (and I don't think it can be fixed, though if it were possible I'd love to have it done) - but I couldn't pass it up. The guy who sold it to me said he thought it was from anywhere between the early 1920s - the early 1940s. It's not marked anywhere, so his guess is all I have to go on. 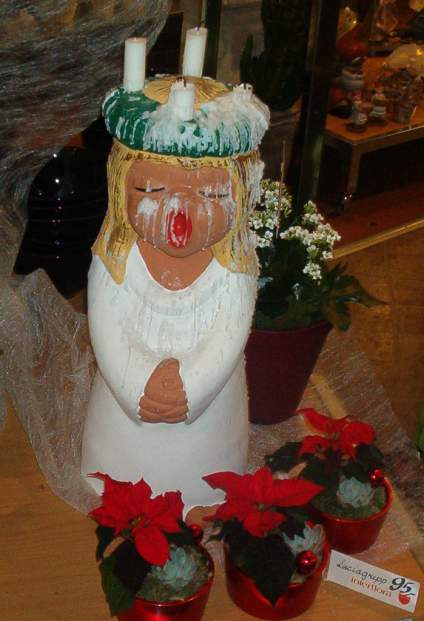 I'm not sure why it has pictures of snow on it - it goes with the corresponding Bible verse (Job 38:22) , yes, but why that particular verse? So many mysteries in one little child's toy. Even though it doesn't work, I love it and I wish I knew where it came from. I'm thinking it, you're thinking it, we're all thinking it. So there's really no need to say it, is there? "I will not leave you alone." ...is what this picture says, though you can't really see it. For me, it conjures up images of Jesus as your annoying little brother on a long car trip. "MOM!" "I'm not touching you! I'm not touching you!" "MOOOOOOOM!" And really, she can't very well ground our Lord and Savior. Like a little boy playing in the tub with his toy boats, eh? Yeah, but can it turn the water into wine? 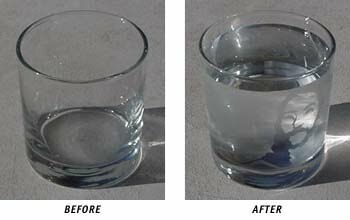 Magic glasses - pour in cold liquid and the image appears. But I won't tell if you won't. As far as I'm concerned, it's a miracle. 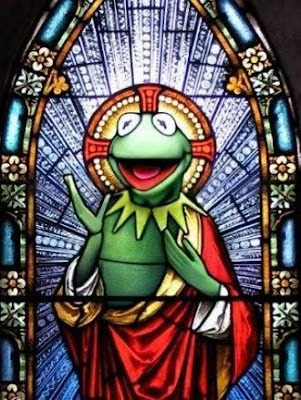 Honestly, I can think of worse people to make into religious icons. Even if I'm using the word "people" loosely. A gentle poet's soul that changed the world for the better. Sound like anyone else we know? Maybe I should start calling these "bored games." I kid. 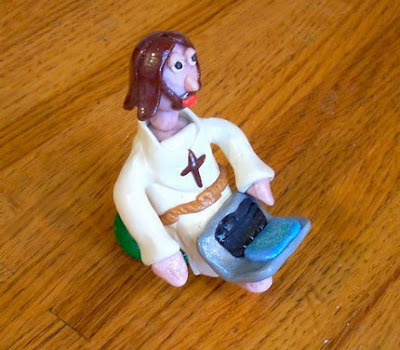 What kid WOULDN'T want to play Salvation Challenge? 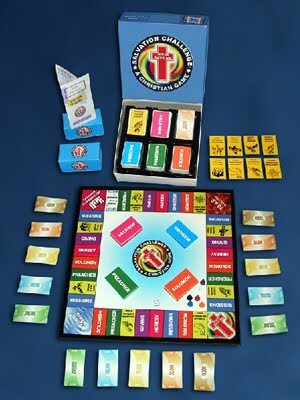 After the University of Nebraska Monopoly game I saw a few days back, this shouldn't surprise me. 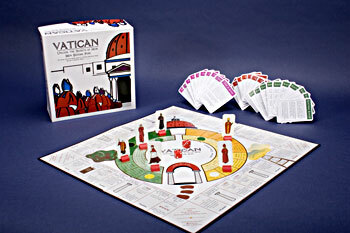 They really will make a Monopoly game out of anything. 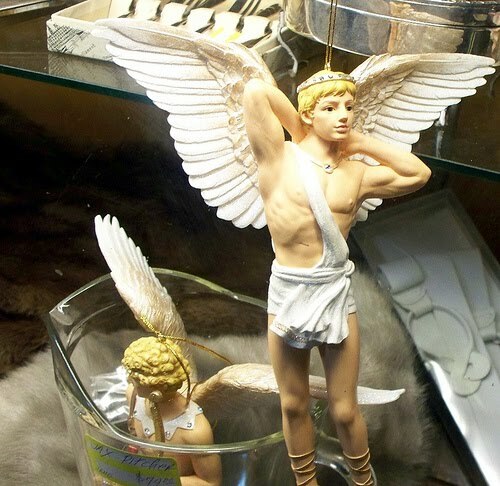 I DON'T THINK THIS WAS WHAT THEY HAD IN MIND. ...yeah, I totally have one of these on my purse. 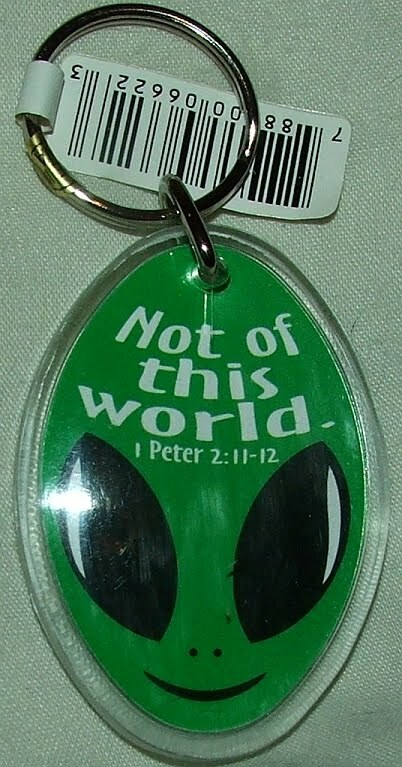 I like aliens, I like Jesii. I had to have it. is it a wookiee? is it chuck norris? is it bigfoot? 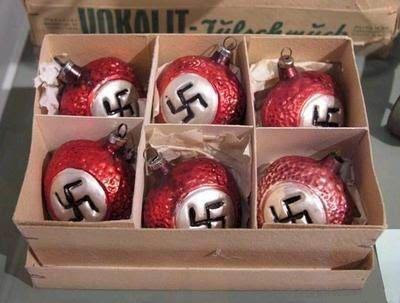 Who wouldn't want this on their Christmas tree? "This is my body, which will be given up for you." I'm relieved that by the time I came around, they'd switched to those little wafers. 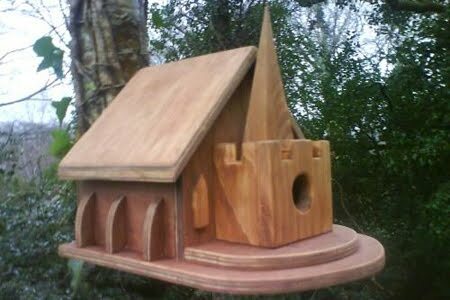 Are the birds in your backyard just not holy enough? A dirty calendar for religious people. Isn't lust a sin? 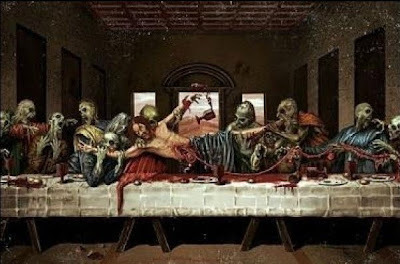 I guess they realized that playing poker is a sin. 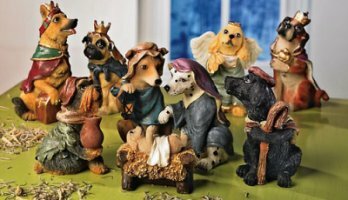 Puppy Jesus is adorable, but I LOVE the Wise Man pug! 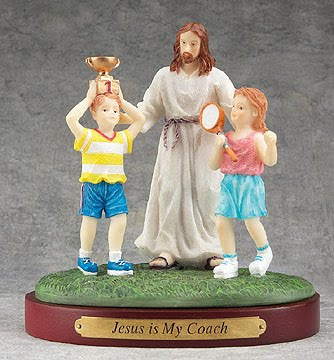 The last coach statuette. 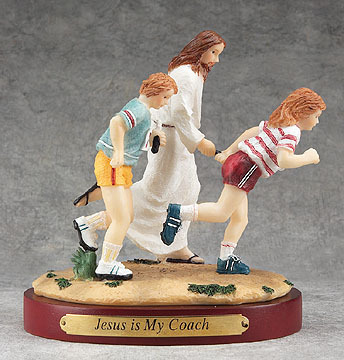 I do appreciate that they appear to be racing on Jesus's home turf, but my favorite thing is the stinkeye Jesus is giving the kid he's racing against. 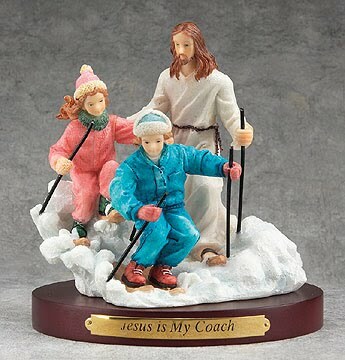 These statues are making me think Jesus has a competitive streak. Winning isn't the most important thing. 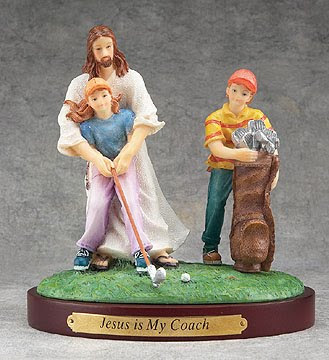 All the others show the kids and Jesus playing their sport of choice. But not this one. I wonder why. (I assume because it would be too hard to fit a tennis match on that little base, but maybe someone out there can come up with something clever.) 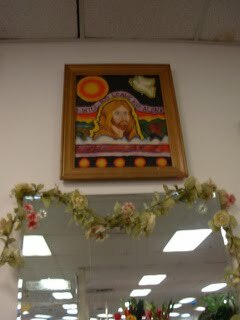 The boy looks pretty unimpressed for having Jesus right there next to him. Kids today. 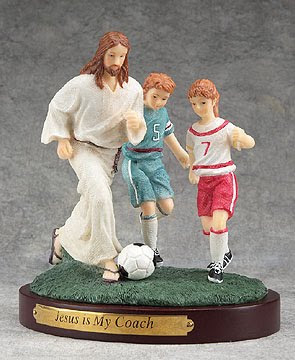 Is Jesus...stealing the ball from that kid?! He is! He so is! That's cold, Jesus. Well hey there, schussin' boots! Say the title in a Ned Flanders voice. I bet he'd love this one. "If anyone strikes you on the right cheek, turn the other also." If tackling Jesus sends you right to hell, I don't want to know what punching him will get you. Also, wtf is a pink belt for? 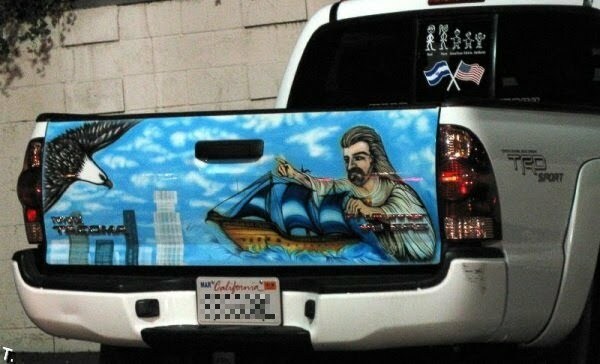 Jesus saves, passes to Moses, he shoots, he scores! This is the best thing to happen on ice skates since Reptar on Ice. 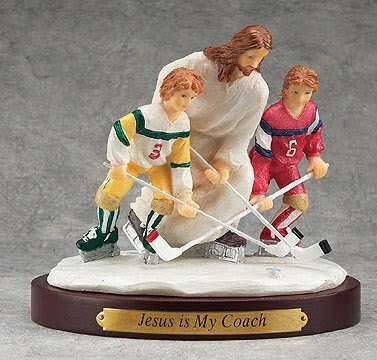 I was brought up in a hockey-loving family, and I deeply regret never getting this piece of brilliance for my dad on Father's Day. Probably the biggest failure in the series. 1. How is this gymnastics? (Yes, it's meant to be gymnastics.) Last I checked, gymnastics didn't tend to involve holding ridiculous poses. 2. 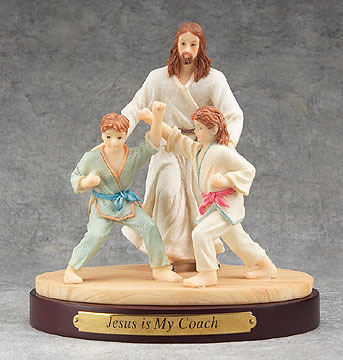 Jesus doesn't appear to be doing much coaching. 3. He does appear to be looking on these kids in an unwholesome manner. 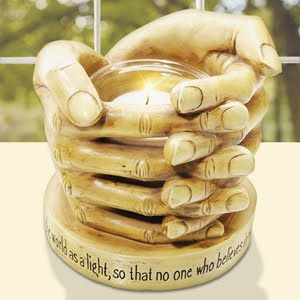 Keep those hands where I can see 'em, Lord. No, no, there are TEN Commandments, not four! Oh, wait, you meant "FORE!" I am however curious: do children really play golf that often? My school offered a wide array of sporting events, but never golf, and I never knew anyone who played it as a kid. 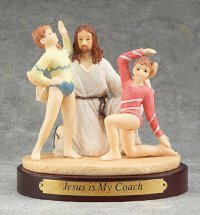 Again, I feel left out: my sports of choice were skating and equestrian, neither of which Jesus coaches!